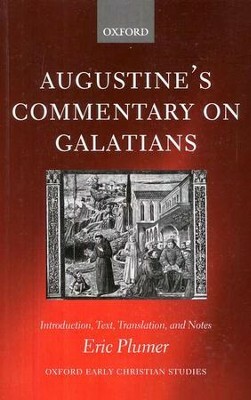 Augustine’s Commentary on Galatians is one of his earlier writings, before he weighed in on major controversies. So, it is without controversy that Augustine passes comment on salvation by faith alone, the role of sacraments (in the Old Testament at least), and salvation through Christ alone. I offer these excerpts simply because they may be the most controversial within an otherwise pedestrian, uncontroversial book. Excerpts are from Eric Plumer’s translation. [A] person fulfills the works of the law when his weakness is aided not by his own merits but by the grace of God–they would not have demanded from the Gentiles carnal observances of the law but would have known that the Gentiles could fulfill spiritual works of the law through the grace of faith. “For by the works of the law” (that is, if people attribute them to their own power and not to the grace of the merciful God) “no flesh” (in other words, no person, or none who think in a canal way) “will be justified.” And therefore those who believed in Christ when they were already under the law came to the grace of faith no because they were righteous but in order to become so (15:15-17). …God is not so unjust as to defraud righteous persons of the reward of righteousness, because there has not been announced to them the mystery of Christ’s divinity and humanity, which was manifested in the flesh…[Is it possible for someone to] believe in God who made heaven and earth…and thus accomplish His will, uninstructed with any faith in the death and resurrection of Christ? Well, if this could have been done, or can still be done, then for my part I have to say what the apostle said in regard to the law: Then Christ died in vain. Galatians 2:21 For if he said this about the law, which only the nation of the Jews received, how much more justly may it be said of the law of nature, which the whole human race has received, If righteousness come by nature, then Christ died in vain. If, however, Christ did not die in vain, then human nature cannot by any means be justified and redeemed from God’s most righteous wrath— in a word, from punishment— except by faith and the sacrament of the blood of Christ. Hence, when Augustine speaks of righteousness not coming from the Law, he speaks both of the Mosaic Law and Law of Nature. In both discussions, Augustine shows that faith in Christ is the only way a man is made righteous and fulfills the spiritual works of the Law is through the grace (or gift) of faith. Okay, if it is not Faith + Works, can it be Faith + Sacraments? “For the whole law,” he says, “has been fulfilled in one phrase: ‘You shall love your neighbor as yourself. '” He says “the whole law” now, after the works having to do with good morals, because the works that are counted among the sacraments, when understood by free people and not carnally observed like slaves, necessarily refer to the two commands of the love of God and neighbor also (44:2). It should be noted that Augustine does not once refer to the seven sacraments in his commentary as additional works needed for salvation. In other books, Augustine argued that baptism was essential for salvation, but even this can be conferred by faith if one died before receiving the actual sacrament. So, the practicing of church sacraments are an outpouring of faith, not a requirement needed in addition to faith. Therefore, the sacraments do not lead to grace, but they are “signs” of God’s grace received by faith. [T]he Apostle begins to show how the grace of faith is sufficient for justification apart from works of the law, in case anyone was saying that while he does not attribute a person’s entire justification to works of the law alone, neither does he attribute it to the grace of faith alone, but rather claims that salvation is accomplished by both. But in order to treat this question carefully and avoid being misled by ambiguity, one must first realize that the works of the law are in two divisions. Some come under sacraments, others under morals (19:1-2). Being that Augustine felt that Old Covenant sacraments were not needed in addition to the grace of faith, it stands to reason that he would have not felt that the sacraments of the church of his day, whatever they were in addition to baptism, would have been somehow different. It is also worth noting that like a Presbyterian, Augustine split the Law between it’s moral and sacramental halves. To Augustine, the moral element is still binding and not necessarily fulfilled fully in Christ. [T]his righteousness of faith was not given to human beings on account of merit but on account of God’s mercy and grace, it was not generally available before the Lord was born as a human being among human beings (24:11). For we necessarily act in accordance with what delights us more, as for example when the beauty of an attractive woman meets our eyes and moves us towards a delight in fornication. But if through the grace that is in faith in Christ, that inmost loveliness–the pure beauty of chastity–delights us more, we will live and act in accordance with that, not behaving with sin reigning in us so that we obey its desires, but with righteousness reigning through love with great delight (49:6). He maintains his indifference to the end in case anyone thought he had acted hypocritically in circumcising Timothy or was doing so in circumcising anyone else…For he is showing that it is not circumcision itself that is harmful to believers, but placing one’s hope for salvation in such observances (63:1-2). It is important to remember, that within the context of this commentary Augustine considers circumcision a sacrament. Hence, any sacrament is misused when it, apart from faith, gives any grounds of confidence to anyone for their salvation. For God’s grace through faith is the only thing which we may with confidence approach God.